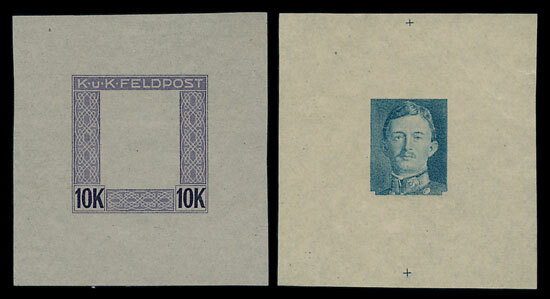 Lot 403 which features in the Austria section of the sale and includes a quantity of forty Austro-Hungarian 1917-18 Military Post Die Proofs. These proofs depict the vignette and the frame individually, with both elements isolated from the other. Issued on woven paper the two separated designs provide a deconstructed image of the finished stamp. The Proofs in this collection are visually pleasing and would make good additions to a serious Austrian collection. Lot 427 includes over two hundred Danish essays comprised within an album. Featured in this collection are mainly unadopted stamp designs from the 1930s and it is rare for material like this to be sold in the UK. If you compare these essays with the adopted designs the creative changes that take place during the process of designing a stamp become clear. For example the 1938 150th Anniversary of Abolition of Villeinage (pictured below in green) is very different to the final issue (also pictured) despite still maintaining the same prominent depiction of the monument. There is a visible change in both the use of colour and the detailing. The finalised design utilises a block colour red backdrop whilst the unadopted features horizontal green lines that build to create shade on both the background and the central monument. 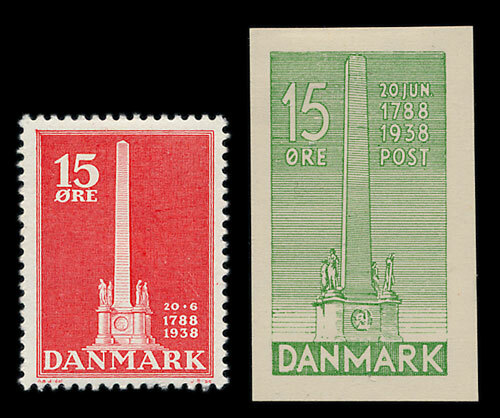 There are also differences in composition with the genuine stamp featuring the value and date at opposite corners as opposed to the equal placement of these two figures on the unadopted design. Although largely similar these two designs illustrate how the design process transitions through ideas before ultimately settling on a singular design that will be mass produced and sent across the globe on the outside of envelopes. 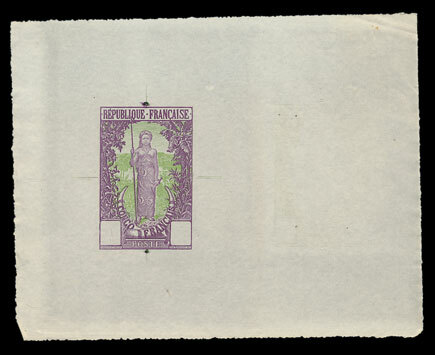 Lot 450, a very impressive range of Die Proofs for the 1900 French Congo values includes a total of seventy one proofs and a further twenty four colour trials. Aesthetically this collection is beautiful and features frame/vignette only prints as well as blocks of four and imperf colour trials. These Die Proofs offer great insight into the way the final prints are constructed. The image below exhibits how both the central design and the border exist as two separate entities that are then combined during the printing process. A gap is left for the stamps value to be inserted and the space remaining in the middle allows the design to sit between the border with just enough room on the lower animal tusks for ‘Congo Francais’ to be printed. 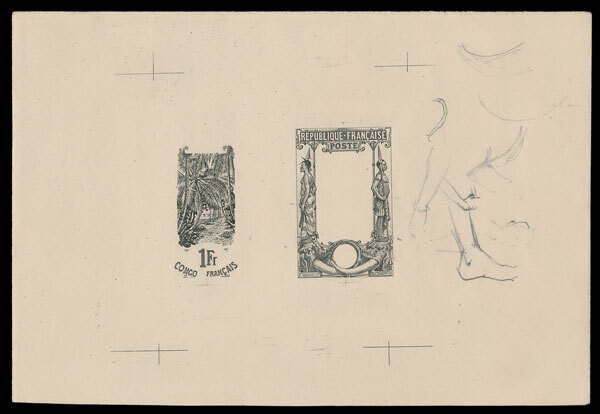 Proofs such as these and the others available in this sale are great examples of postal history and demonstrate the creative processes involved in the design of philatelic material. There are many other lots in the sale that feature Proofs or Essays and they can all be found in our online catalogue here. Further to this we have an extremely impressive and unique collection of Italian Proofs and Essays available in our May 1st 2019 stamp sale. 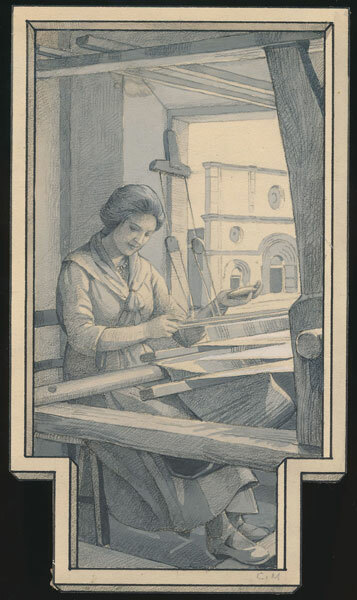 These include original sketches and modellos by the artist and stamp designer Corrado Mezzana. It is unlikely a collection like this will be seen again in this volume and is truly not to be missed!